Hi guys! It’s Gab from Artful Desperado with a new recipe of Green Huevos Rancheros and Cornmeal Waffle that’s perfect for your next summer brunch gathering, or even for yourself if you want to indulge. This recipe is a twist on a Mexican classic. If you’ve never tried huevos rancheros they are basically the best breakfast ever: sunny side up eggs with salsa, chilies, and beans or avocado (or both), they are served on top of a crispy tortilla and they are super tasty. 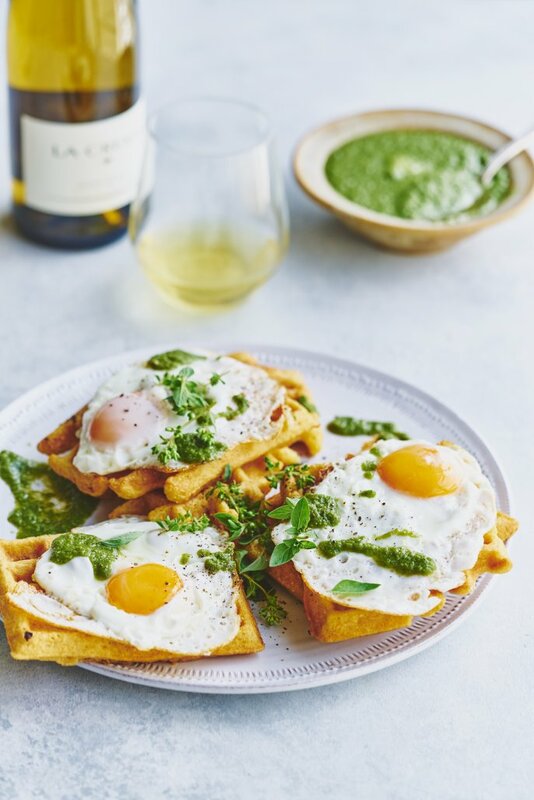 For this recipe I swapped the tortilla for crispy cornmeal waffles, and the red salsa for a green tomatillo-based salsa which has more acidity and it pairs fantastic with the waffles. 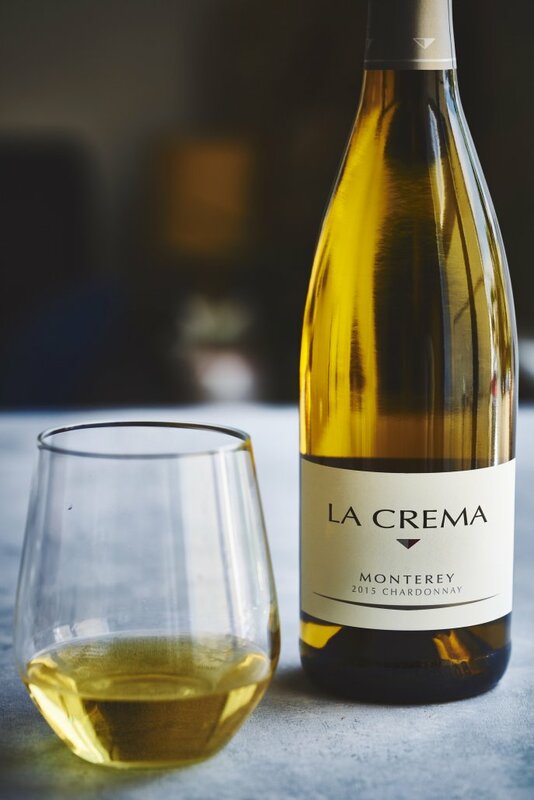 Speaking of pairings, it wouldn’t be brunch without a glass of something nice to sip, so I paired this recipe with La Crema Monterey Chardonnay , the combo of citrus notes on this wine along with the nice acidity makes it the perfect chilled glass to enjoy while having some of these waffles. It’s also summer! 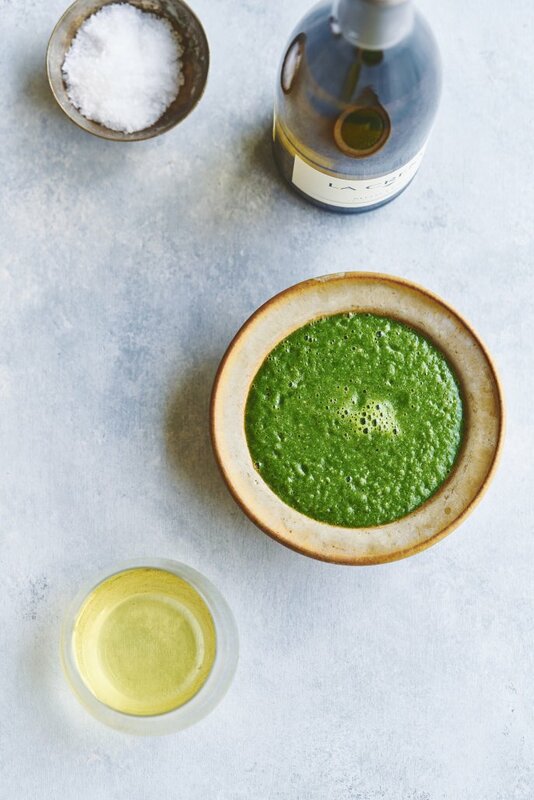 So you totally need to get your Chardonnay on. To make the waffles: Combine the dry ingredients, make a well, then mix in the wet ingredients until incorporated. 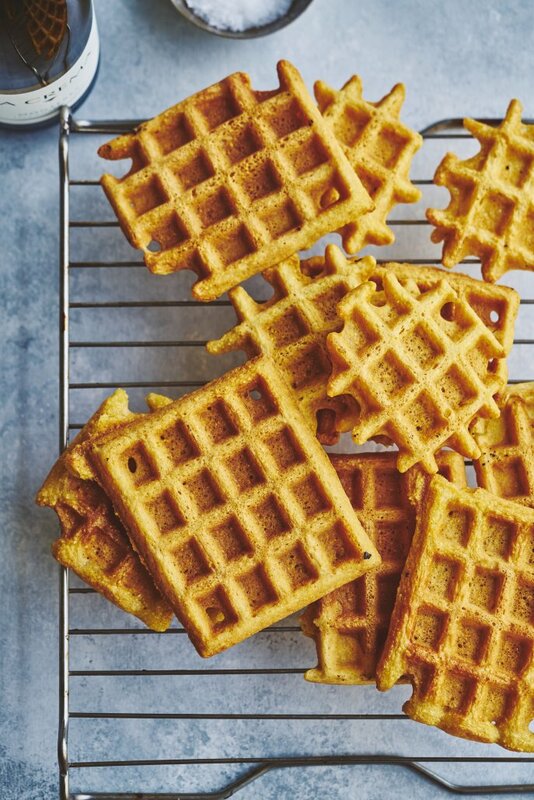 Heat up your waffle maker, scoop the batter, and cook until crispy on the outside. 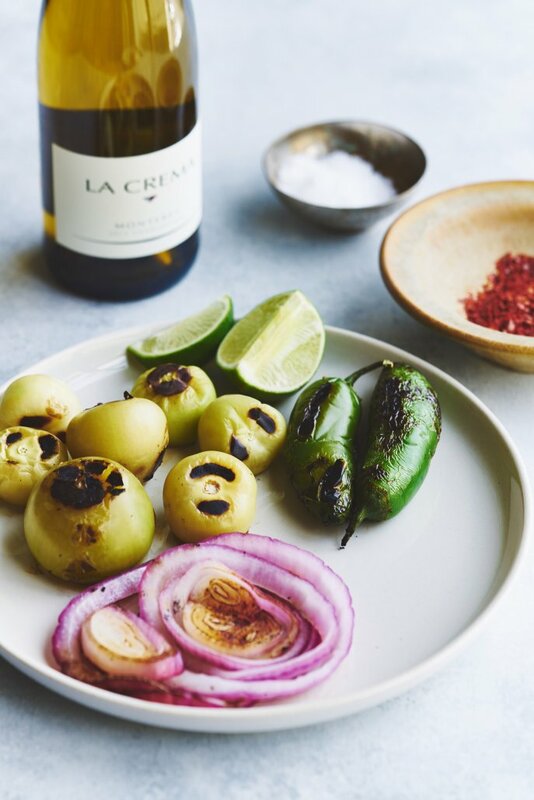 To make the eggs: start by making the salsa, first blacken the jalapeno, onion, and tomatillos, then put in a blender with the rest of the ingredients, taste for seasoning and adjust if needed. 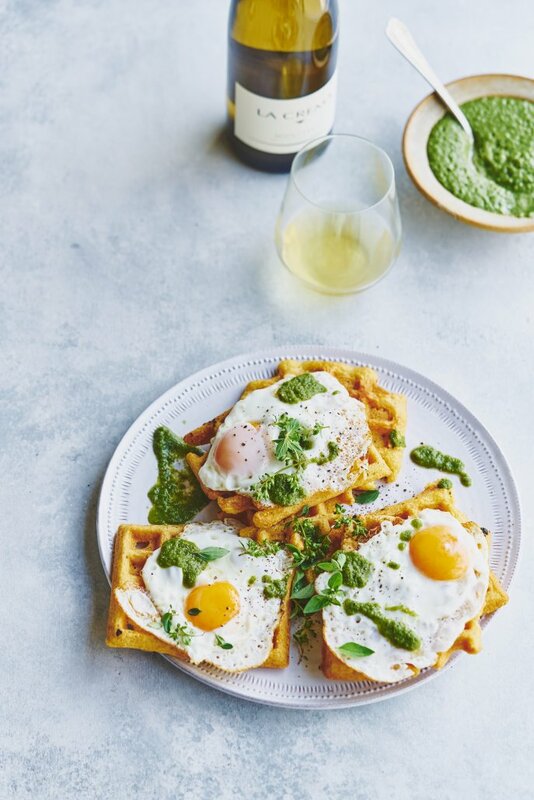 To plate: place the waffles on a plate, add salsa on top, fry a sunny side up egg and place it on the waffle, top with extra salsa, parsley or cilantro, and some chopped cashews for crunch. Oh and by the way, I recommend you grind your cornmeal in the blender for a few minutes before putting it in the waffle batter, this way you’ll get a nice crunch but without huge gritty pieces of corn.